ORLANDO, Fla. (September 22, 2015) — Global-5 Communications is pleased to announce it has been awarded with the Florida Department of Transportation (FDOT) the 2015 American Association of State Highway and Transportation Officials (AASHTO) Transcomm Skills Award in the category of “Website with Consultant” for its work to create the I-4 Ultimate website (I4Ultimate.com). The contest, conducted by the AASHTO Subcommittee on Transportation Communication, is the premier communications competition in the transportation industry, and the awards have become a standard of excellence among state departments of transportation. 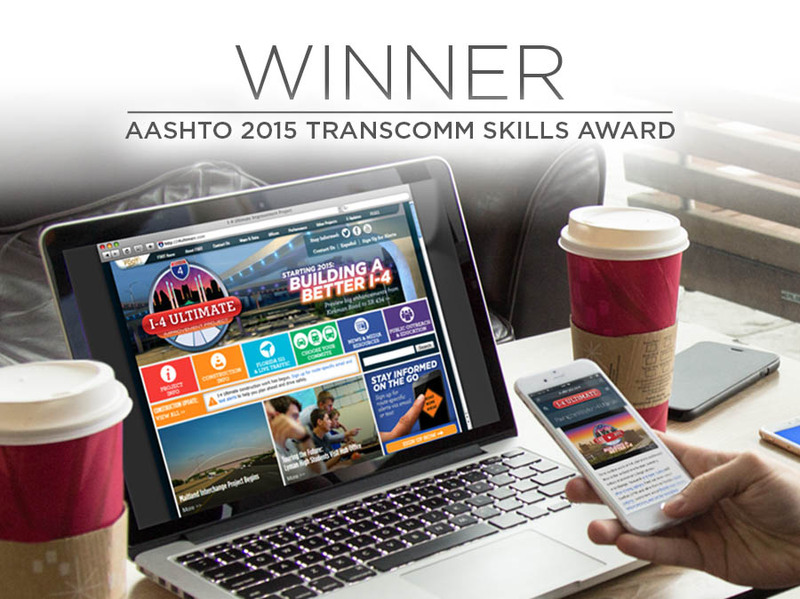 According to the AASHTO Subcommittee on Transportation Communication’s website (http://communications.transportation.org), the Transcomm Skills Award winners demonstrate the very best examples of innovation, planning, production, execution, and evaluation of results and budget. The I-4 Ultimate website features a robust content management system with a news scroll on the home page as well as multimedia content for the public and news media. More than 10,000 individuals receive an I-4 Ultimate monthly newsletter and weekly construction alerts by signing up through the website. Other tools on the I-4 Ultimate website include information from Florida’s 511 Traveler Information System, recommended alternate routes and content available for sharing on social media. Global-5 Communications is the nation’s premier transportation communications firm. Global-5 has provided award-winning support to clients for nearly 20 years, working with numerous state departments of transportation, the Federal Highway Administration (FHWA) and many other transportation clients. For more information, please visit Global-5.com.